Let’s Discuss “Creepy, Funny, Middle Grade Reads” by David Neilson! Happy and blessed Friday everyone! 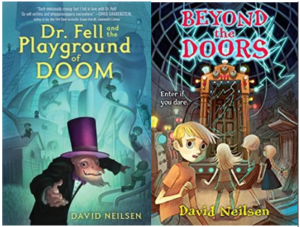 In today’s episode, we’re super excited to share a conversation that we recently had with one f the spooky middle-grade authors David Neilson, about his scary middle-grade children’s books Dr. Fell and the Playground of Doom & Beyond the Doors! Davis’s Middle-Grade novel, Dr. Fell and the Playground of Doom, won the Silver Falchion award for Best Tween/YA Horror or Fantasy novel of 2017 at this year’s Killer Nashville conference! We’re so EXCITED to learn all about his craft and his funny, creepy books. So grab a cup of coffee and let’s get started! David Neilsen is the author of odd, weird, supernatural, and occasionally slightly disturbing stories. 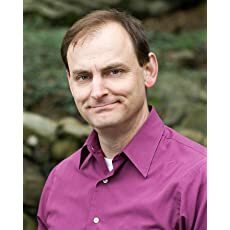 His debut novel, Doctor Fell and the Playground of Doom, was published by Crown Books for Kids (a division of Random House) in August of 2016. His next book, Beyond the Doors, will be published on August 1, 2017. David is based next door to Sleepy Hollow, NY and also works as a professional storyteller up and down the Hudson River Valley. His one-man performances based on the work of H.P. Lovecraft have sent many screaming into the hills in search of their sanity while his education school presentations have inspired hundreds of Middle Grade-aged children. Check out David’s website for more information about his book, exciting children’s activities & more!! 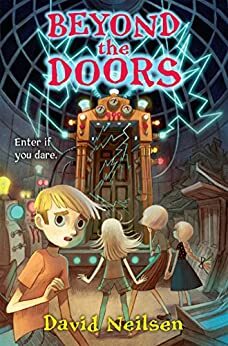 Fans of A Series of Unfortunate Events and Coraline will devour this dark and creepy, humor-laced tale about four siblings who discover a mysterious world where secrets hide around every corner. When a family disaster forces the four Rothbaum children to live with their aunt Gladys, they immediately know there is something strange about their new home. The crazy, circular house looks like it stepped out of a scary movie. The front entrance is a four-story-tall drawbridge. And the only food in Aunt Gladys’s kitchen is an endless supply of Honey Nut Oat Blast Ring-a-Dings cereal. Strangest of all are the doors—there are none. Every doorway is a wide-open passageway—even the bathroom! Who lives in a house with no doors? Their unease only grows when Aunt Gladys disappears for long stretches of time, leaving them alone to explore the strange house. 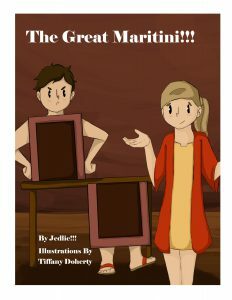 When they discover just what Aunt Gladys has been doing with all her doors, the shocked siblings embark on an adventure that changes everything they believe about their family and the world. 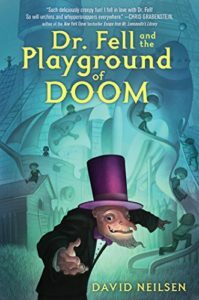 Dr. Fell and the Playground of Doom and Beyond the Doors are in stores now! They make for great gifts! Grab a copy today! What was the inspiration for his middle-grade novels Dr. Fell and the Playground of Doom & Beyond the Doors? When did David first discover his love for horror stories and all things creepy? Importance of reading with kids and asking their opinions? An exclusive sneak peek into some of the exciting upcoming books by David..
A big thank you to David Neilsen for joining us and for sharing his stories with us! So, there you have it. We’re sure you’ve enjoyed learning about Dr. Fell and the Playground of Doom & Beyond the Doors, as much as we did! If you’ve enjoyed this episode then please rate and review our show on iTunes and share it by clicking the social media buttons at the bottom of this page! PreviouslyRWYK Interview with Laura Jordan & Scott Jordan: YAY Margaux!